The family-run City Aparthotel München is in the centre of Munich, a 2-minute walk from Karlsplatz (Stachus) Square and Sendlinger Tor. It offers air-conditioned, soundproofed apartments with free WiFi internet in all areas. All apartments at the City Aparthotel feature fully-equipped kitchenettes and also have a 42-inch flat-screen satellite TV, a laptop safe, a private bathroom with a shower, a hairdryer and a washing machine. An iron, ironing board and drying rack are also provided. 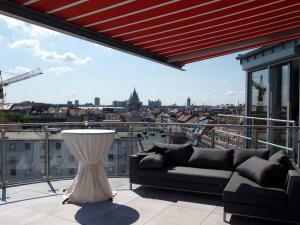 There is a leased restaurant on site as well as many small shops, restaurants and café around Karlsplatz. Munich’s Frauenkirche Church is just a 15-minute walk from the City Aparthotel München. Munich's pedestrian area begins here, and excellent public transport connections are available. The Oktoberfest beer festival is 2 train stops or a 20-minute walk away and the neighbourhood Ludwigsvorstadt is well liked by fans of history and architecture. Cleaning takes place every day. Bed linen is changed once a week. Please note that for stays longer than 14 days, there will be a end cleaning fee of € 100. Please note that for the Roof Top Suite with Private Roof Terrace a security deposit of € 500 is required. Baby crib is available upon request for free. Please be advised that special terms and conditions may apply for bookings of 5 rooms or more. Please note that the property now offers high-chairs (free of charge, and on request) and a baby phone (on request and subject to a security deposit of € 80). Cots/cribs are provided free of charge.